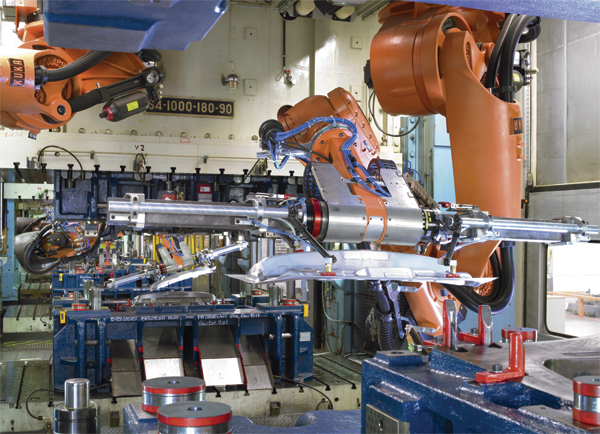 Kuka robots replaced a two-axis feeder system along this stamping line at a German automotive plant that produces body panels and structural components. The crossbar-robot retrofit dramatically increased the output of the line—by as much as 40 percent when stamping structural components and 80 percent when stamping body panels such as fenders and roof frames. Several crossbar robots are at work at stamping plants in China, Europe and the United States. Here we present one recent successful project involving the replacement of a two-axis feeder system with a crossbar robot automation retrofit, completed at a German automotive plant. The stamping line in question produces body panels and structural components, and the new automation allowed the manufacturer to improve transport flexibility while also increase line output. The performance improvement resulted from the ability to accurately orient the parts with three rotating axes while transferring parts between presses, as well as the highly accurate positioning of the parts in the die. The manufacturer dramatically increased the output of the hydraulic-press line by as much as 40 percent when stamping structural components such as inner and outer B pillars and side members. In addition, throughput of body panels such as fenders and roof frames increased by as much as 80 percent (see the accompanying table). Like a crossbar feeder in a press line, the robot transports parts in a single action from one die to the next and, where necessary, repositions them with a great degree of flexibility. When retrofitting a crossbar robot to an existing line, the distance between the presses should fall within the range of 15 to 30 ft.
A key advantage of the robot: only one robot is needed per interpress gap to transfer parts from one press to the next. This dramatically reduces costs when compared to using feeders for interpress transfer, as feeders require one loading and one unloading unit per press gap, as well as an intermediate station to pick and place the parts. 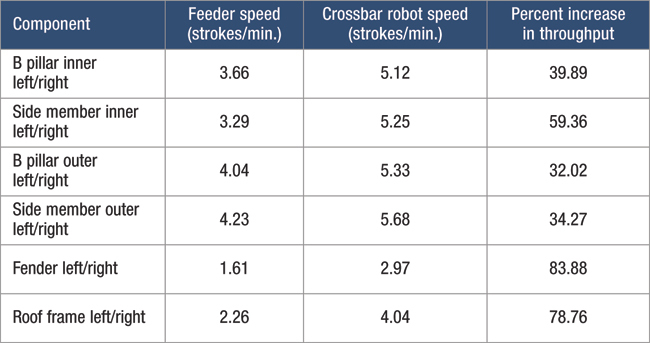 The crossbar robot’s six axes of motion also deliver added benefits. The hanging track and a swinging axis fixed to the robot’s hand provide improved flexibility for transfer motion, similar to that of a human wrist that can move in numerous directions. Article provided by Schuler Inc., Canton, MI: 734/207-7200; www.schulergroup.com.